Many of us love the thrill of firework night. The darkened skies are awash with colour alongside bangs and whizzes in all directions. The golden leaves of Autumn cover the pavements and the smell of bonfires fill the air. It’s an exciting time and marks the arrival of the coming winter months. That’s seeing firework night from our perspective. But what about seeing firework night from a cats perspective? Hearing and sight are important for a cat when hunting. The ears are used to locate prey and whereas humans can hear up to 20,000 cycles per second (cps) cats can detect sounds as high as 60,000 to 80,000 cps (1). Can you imagine how loud the bangs and whizzes would sound to a cat even when the fireworks were being let off at a distance? The cat has no concept of what a firework sound is. It is a totally un-natural sound that has no relevance to the world it knows including the sound of its prey. The cat perceives the bangs and whizzes as harmful, unnatural and terrifying with no concept of what they mean or where they are? We have all seen a normal cats response to the unexpected loud clap of a hand to the falling of an ornament as it hits the floor. It is usually one of shock before they can see and sense that they are not in further danger, that no other noises follow and that peace resumes in their safe core territory. Imagine the cats threat level hearing the loud noises outside that do not stop but continue to batter the air, sounding like they are getting closer. Wherever the cat runs to hide the noises can be heard. Will, what ever is making the scary loud noises, enter my safe core area to harm me? WHAT CAN WE HUMANS DO? 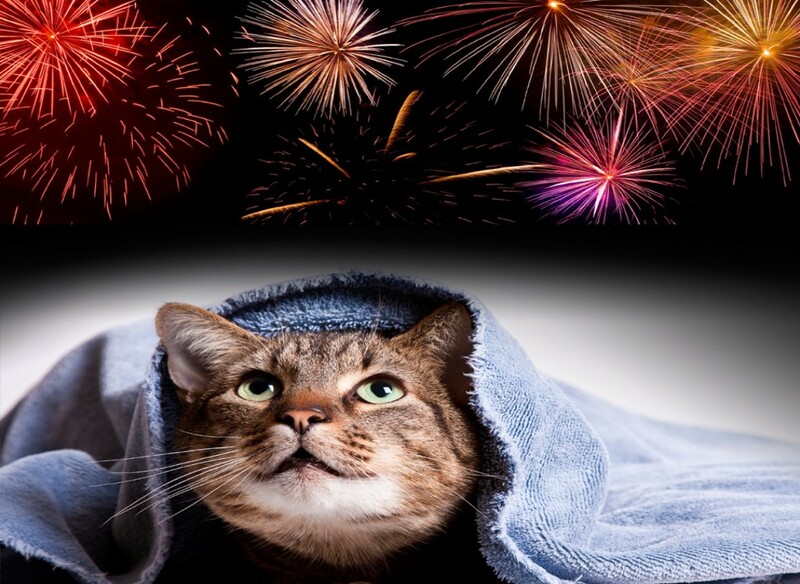 We cannot stop fireworks and we cannot stop a cats fear of them. What we can do, however, is assist in helping a cat on the dreaded firework night. Set up a safe hidey hole for your cat which could be access to under the bed, a cardboard box, covered in a blanket, placed in an area of the home that hears the noise the least or free easy access to where ever your cat chooses to run and hide in the home. Close the curtains so any flashing lights cannot be seen. Plug in Felliway or Natural Remedy a few days before the big day or when you know your local firework display will be on. Sit calmly with your cat reassuring them with head and cheeks strokes alongside their favourite treats. Don’t force them out of their hidey hole trying to make them understand there is nothing to be afraid of. It won’t work. Cats see life very differently from us. Very few cats enjoy firework night. Cats pick on on human energy so act naturally. Continue watching TV, stroke your cat in a relaxed manner in their chosen hiding spot or high up area. Offer treats as a positive association to the noise outside and as a way of trying to relax your cat and re-focus them. Another thing a cat owner can do is to put on some relaxing cat music. Check out: https://www.musicforcats.com/ by David Teie. If you have a free roaming cat keep them locked inside on November 5th or the night of any local firework display. Double check the cat flap is locked. Cats may bolt in fear if outside and may bolt into the path of a car or out of their known territory into one whereby they cannot find their way back home. It is very important your outdoor cat is microchipped so that, if your cat becomes lost and disorientated, you stand a better chance of finding them. Read LOST CAT ADVICE. You may be feeding a feral cat(s). A feral cat lives outside so is very street wise but they too will probably hate fireworks. If you have a garden or outside area to place a warm small shelter then do so. As well as firework night, feral cats need warmth to see them through the winter months. Google OUTDOOR SHELTERS FOR FERAL CATS to get some ideas. Stay safe and help your mog out this firework night!